Today we’re paying a fresh visit to our favorite virtual machine platform and introducing a turnkey unified communications server for home, SOHO, and small business use. Unlike last week’s platform that required a $35 investment in a Raspberry Pi 2, this week’s offering requires zero hardware investment. And you still get the same software collection at the same great price, totally free… as in beer. The VirtualBox® platform runs atop any Windows PC, Mac, Linux desktop, or Solaris machine and uses a small portion of the desktop computer’s available resources. Other than that, everything works just as if you were running your PBX on standalone hardware. Today’s release is built atop the new Scientific Linux™ 6.7 platform and features the latest LTS release of Asterisk® 13 and a terrific collection of GPL modules from FreePBX® 12. It also is our first opportunity to showcase one of our new Certified Incredible PBX™ builds. Certification is a new process that involves rigorous testing of the entire Incredible PBX platform to verify that every component is not only reliable but also works in harmony with the rest of the pieces of the unified communications suite. You’ll find all of them here. Think of Incredible PBX as the glue stick that assembles all the necessary VoIP components and holds them together seamlessly. As with all Incredible PBX builds, you also get the full complement of goodies including dozens of text-to-speech apps, voice recognition and dialing, SMS messaging, free fax support, reminders and wakeup calls, and SECURITY! The other major advantage of Incredible PBX on the VirtualBox platform is a turnkey install in less than 5 minutes! Just choose the Windows PC, Mac, Linux desktop, or Solaris machine and off you go. Is VirtualBox merely a sandbox for experimentation? Absolutely not. With any of the beefier desktop computers available today, running Incredible PBX as a 24/7 VirtualBox image is every bit as feature rich with stellar performance that’s equivalent to using dedicated hardware. And there are some added advantages. Obviously, deploying a turnkey VoIP platform in under 5 minutes is a major plus. But, unlike using a dedicated Linux platform, you also get the ability to take snapshots of your system and do full backups in minutes instead of the hours required to bring down dedicated hardware, load a different backup application using a different operating system, perform a backup, and then reboot your VoIP server. And your backups won’t just run on the one server on which the backup was performed. You can restore the backup to any other computer that can run VirtualBox. For any of you that came from a network management background, you know what a big deal that really is. And there’s one more bonus. With Incredible Backup and Restore, you can move your image to dedicated hardware running the same operating system with Asterisk 13 and the same GUI platform in minutes. Need to deploy VoIP servers at dozens of sites around the globe? Not a problem with VirtualBox. Just send a preconfigured VirtualBox image to each site and install VirtualBox on a local desktop computer. In 5 minutes, you have a functional VoIP server including interconnectivity to all of your other VoIP servers with a virtual private network already in place to provide secure VoIP connectivity between all of your sites. Are there security compromises using the VirtualBox platform? Not at all. Incredible PBX still comes preconfigured with the Linux IPtables firewall that is locked down to a whitelist of local area networks, preferred providers, and your own IP addresses. You can expand the whitelist using the add-ip and add-fqdn scripts or use PortKnocker and Travelin’ Man 4 tools to let remote users gain instant access. Getting Started. For today, we’ll provide a refresher course on loading VirtualBox and the new Incredible PBX virtual image. Then we want to spend a little time explaining the secret sauce that goes into building these images so that you can do it yourself either to migrate to a different network or to deploy at multiple sites. When we’re finished, you’ll know everything we’ve learned about deploying VirtualBox machines and, unlike Grandma, we won’t leave an important ingredient out of the recipe just to be sure you never forget how good Grandma’s cookies really were. So let’s get started. Oracle’s virtual machine platform inherited from Sun is amazing. It’s not only free, but it’s pure GPL2 code. VirtualBox gives you a virtual machine platform that runs on top of any desktop operating system. In terms of limitations, we haven’t found any although VirtualBox 5 can be a little quirky on some platforms. If you have trouble with getting a clean status report with VirtualBox 5, just drop back to the final release of VirtualBox 4. We tested VirtualBox 4 on an Atom-based Windows 7 machine with 2GB of RAM, and it worked without a hiccup. So step #1 today is to download one or more of the VirtualBox installers from VirtualBox.org or Oracle.com. Our recommendation is to put all of the 100MB installers on a 4GB thumb drive.1 Then you’ll have everything in one place whenever and wherever you happen to need it. Once you’ve downloaded the software, simply install it onto your favorite desktop machine. Accept all of the default settings, and you’ll be good to go. 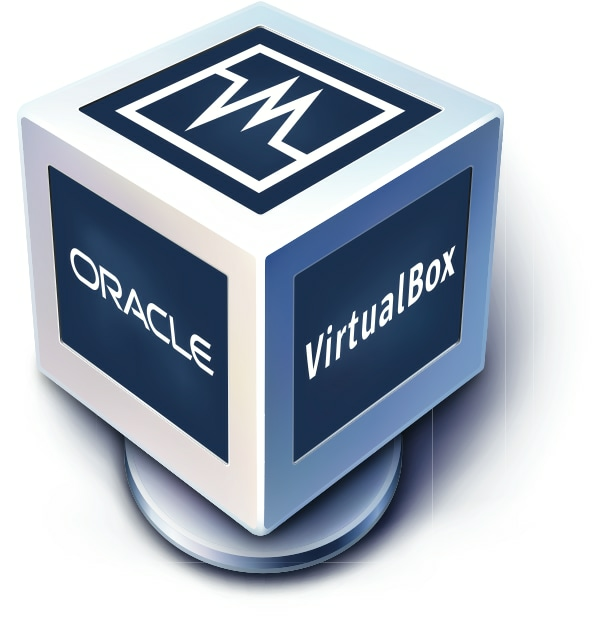 And here’s a link to the latest Oracle VM VirtualBox User Manual. A word of warning on the front end. The Incredible PBX image featuring Asterisk 13 for VirtualBox is huge, about 3GB! There are two ways to grab the .ova image. You can either download the image directly from here or from SourceForge. Or, for better performance, download the torrent and let multiple servers help you get the software quicker. Usually download times are cut by 70% or more. The MD5 checksum is 6037b8319ce9070270474889af76f86d. Click on the Incredible PBX Virtual Machine in the VM List. Then click Settings -> Audio and check the Enable Audio option and choose your sound card. Save your setup by clicking the OK button. Next click Settings -> Network. For Adapter 1, check the Enable Network Adapter option. From the Attached to pull-down menu, choose Bridged Adapter. Then select your network card from the Name list. Then click OK. That’s all the configuration that is necessary for your Incredible PBX Virtual Machine. The rest is automagic. Once you’ve imported and configured the Incredible PBX Virtual Machine, you’re ready to go. Highlight IncrediblePBX Virtual Machine in the VM List on the VirtualBox Manager Window and click the Start button. The SL67 OS boot procedure will begin just as if you had installed Incredible PBX on a standalone machine. You’ll see a couple of dialogue boxes pop up that explain the keystrokes to move back and forth between your host operating system desktop and your virtual machine. Remember, you still have full access to your desktop computer. 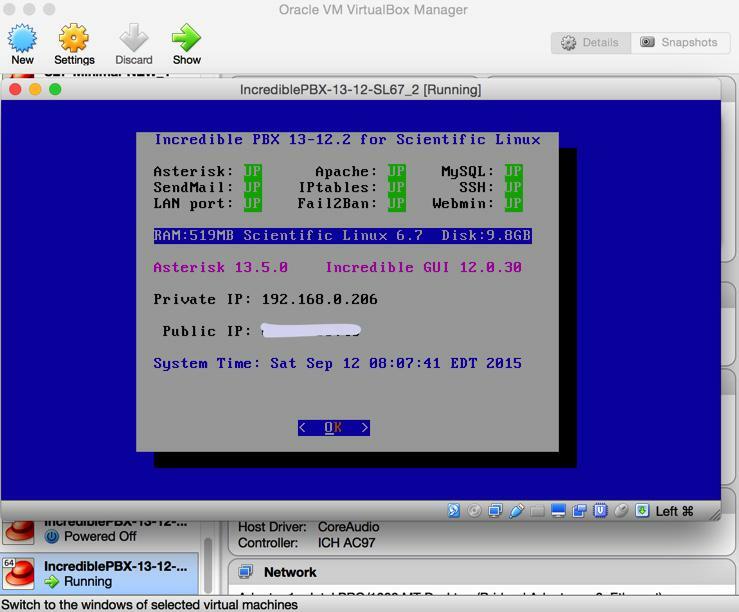 Incredible PBX is merely running as a task in a VirtualBox window. Always gracefully halt Incredible PBX just as you would on a dedicated computer. Here’s what you need to know. To work in the Incredible PBX Virtual Machine, just left-click your mouse while it is positioned inside the VM window. To return to your host operating system desktop, press the right Option key on Windows machines or the left Command key on any Mac. For other operating systems, read the dialogue boxes for instructions on moving around. To access the Linux CLI, login as root with the default password: password. To access the Incredible PBX GUI with a browser, point to the IP address of your virtual machine and login as admin with admin password set above. We recommend that you log in to the Linux CLI at least once a week so that Incredible PBX updates get applied to your server regularly. This is critically important if you care about your phone bill. As the Linux operating systems have become more turnkey, one of the shortcuts that has been implemented on both the RedHat and Debian/Ubuntu platforms is storage of your network setup so that the server reboots more quickly. While that’s fine for rebooting on the same server, it’s a real problem if you attempt to move your setup to different hardware or a new network because eth0 will not load. That means no IP address! Here are two ways to assure that things will actually work after the move. Both assume that you will have a DHCP server at the new location just as you did at your existing site. Once you have halted the server, edit both the sound card and network card settings and disable both of them in VirtualBox Manager. Then choose File -> Export Appliance from the VirtualBox title bar and create a .ova backup image on your desktop. You now have an image that is similar to the Incredible PBX image that you originally downloaded, except it has all of your data and settings. All you have to do is repeat the install drill above at the new location using the .ova image you created and log in with whatever your current root password happens to be. You’ll get a two-pass automatic setup just as you did when you began today’s adventure. The only drawback to this procedure is the fact that the extension 701 and default DISA passwords will be initialized when you first boot from your .ova image at the other location. Aside from that, you’ll have a clean platform with new SSH and DUNDI credentials as well as mostly sanitized log files. Once you have halted the server, edit both the sound card and network card settings and disable both of them in VirtualBox Manager. Then choose File -> Export Appliance from the VirtualBox title bar and create a .ova backup image on your desktop. Now you’re an expert. Enjoy!